Jeff Rierson owns Rierson Fitness, a unique personal training studio in Cedar Rapids, IA. His studio specializes in helping each individual set fitness goals and attain them. They are very kind and personally care about each of their clients so they wanted this to shine through on their website. 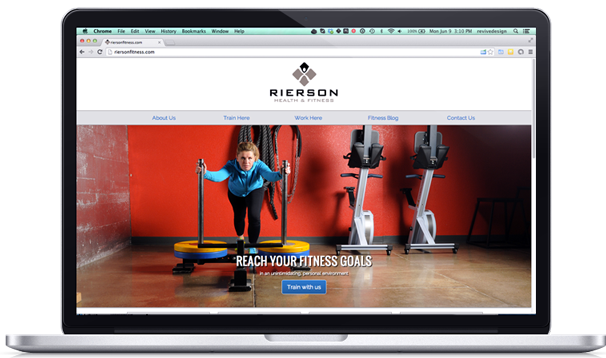 We had a lot of fun working together to craft a unique website that the Rierson’s can edit themselves. It’s refreshing to work with a company that is committed to quality and goes above and beyond to make sure their client’s goals are translated into an easy to use, informative web experience. They are really looking to expand so Breahna created an employment application form where new applicants are sent to apply for open positions. There’s even a PDF uploader built in so personal trainers can send in their resumes! Since we like to think ahead: the application form also keeps track of submissions for the Rierson’s so they can export these into an Excel format to use in their marketing purposes.